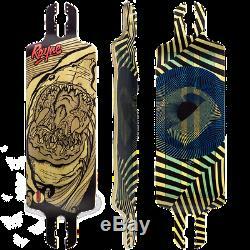 The Rayne Reaper is a shrunk down version of one of the most popular freeride/downhill boards available, the Nemesis. The Reaper has a nice low standing platform due to it's 0.75 drop and drop thru mounting holes. With Rayne's singature "Deep Tub" concave you will feel locked in during even the slidiest of slides. Coming in at 33.25" long and 9.5" wide, this board is a perfect drop deck for those smaller riders, or someone with a smaller stance. Made with the Dee-Lite Construction, this board is 15% lighter than the standard Reaper and features "Long Treks" chopped off nose and tails so you can roll your board behind you like luggage as you're walking back up the hill. It's primary purpose was to be used as a long distance push board, but its also perfect for downhill or free ride board, slashing, sliding, and spinning your way down a treacherous mountain path. To get a great freeride setup, throw some 180mm Calibers longboard trucks and some 70mm Blood Orange Liam Morgan longboard wheels and you'll be leaving those sweet thane lines in no time! Or, if you're that crazy rider looking for mad speed, yo, grab some 180mm Calibers longboard trucks and some 70mm Orangatang 4Presidents longboard wheels and you'll be blasting your way through the hills in no time. Deelite Long Treks Reaper Length 33.25 Width 9.5 Wheelbase 26/27 Drop 0.75. The item "Rayne Dee-Lite Reaper Long Treks Longboard Skateboard Deck with Grip" is in sale since Thursday, April 27, 2017. This item is in the category "Sporting Goods\Outdoor Sports\Skateboarding & Longboarding\Longboard Parts\Decks". The seller is "skateboarstorag0" and is located in Fort Lee, New Jersey. This item can be shipped to United States.